LIGHTSTRIPE is a modular luminaire system. The fitting frames are available in various lengths or for arrangement in rows of infinite length for the formation of linear structures fastened in the ceiling cut-out without any use of tools. 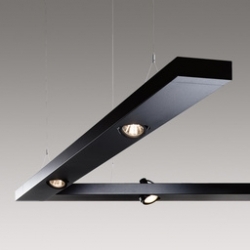 The modular panels are equipped with different types of luminaires and are fastened in the fitting frame by means of a suspension mechanism, without the help of tools. All of the panels can be replaced at any time and their variants are designed in such a way that they flexibly perform every lighting task. 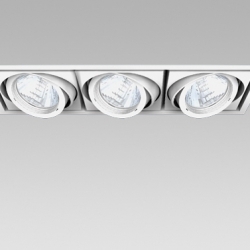 With FLOATLINE, Ansorg provides an economical, linear suspended luminaire system that was developed specially for high-walled salesrooms covering a large area. FLOATLINE impresses with its slim design with a profile height of only 60 mm. Gimbal-mounted profile spotlights are integrated without a frame into the closed system and ensure flexible and brilliant illumination of the merchandise. FLOATLINE is suitable in particular for use above counters, promotional activity areas and traffic zones.